This article refers to few different models of Fender® Stratocaster® tremolo bridge equipped guitars that accepts the pop-in style tremolo arm. They are all American production Strat's®, the Deluxe, Ultra, Elite and Professional models. This article does not refer to the 1983-1984 Dan Smith era Elite Strat®, it uses a different style of tremolo bridge and pop-in arm which is not affected by the same characteristics. 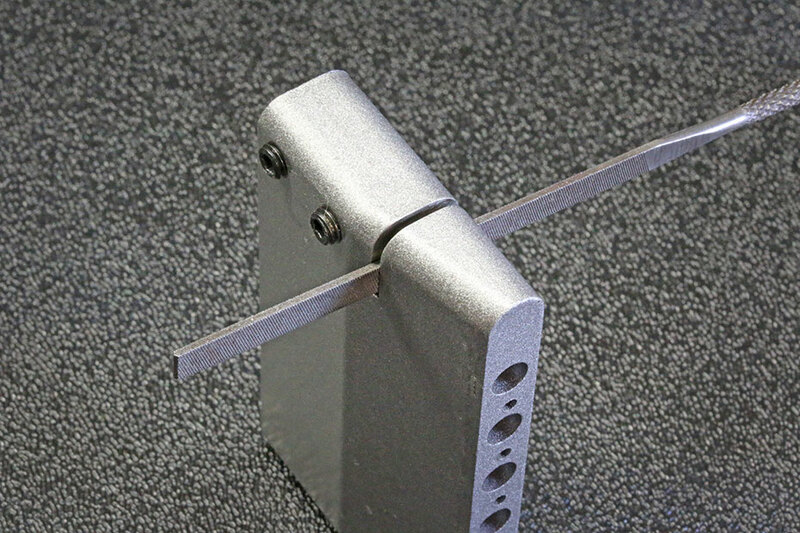 Primarily this article addresses characteristics found within the tremolo arm attachment portion of a specific tremolo block as shown in the photographs below. With these Strat's common model of tremolo block there is a small slot which the tremolo arm retaining clip installs into and often it constrains the clips free movement while installing or removing the tremolo arm which causes a firmer installation and removal of the tremolo arm You can clean up this small slot in the tremolo block by using a flat needle file of no more than 0.050" in thickness which will allow the removal of excess paint or metal material left behind from the machining process. This clean-up will allow the small tremolo arm retaining clip to expand in and out smoothly within this slot when installing or removing the tremolo arm. You will not be altering the slot or changing its dimensions, simply cleaning it out and smoothing the upper and lower flat surfaces so the clip will not scrape on the sides and bind. When your tremolo arm retaining clip is removed inspect it to ensure it is not bent or damaged which would also contribute to a problematic installation or removal of your tremolo arm. The little retaining clip is not manufactured out of a hardened spring steel, so it can get bent and distorted easier causing issues. This is what your clip should look like when new 003-6531-000 or if you need to order a replacement if yours is damaged or missing. 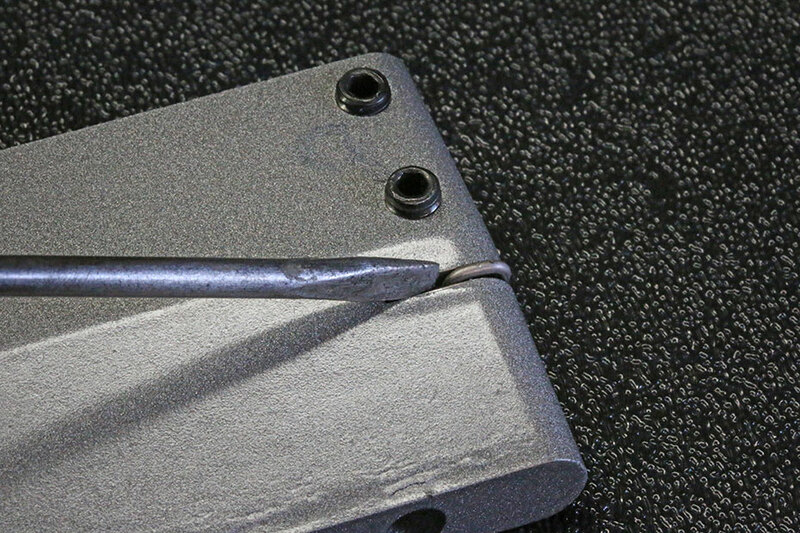 Another issue we have found with the tremolo arm retaining clip is that it is not installed all the way into the block and this will cause the tremolo arm to be difficult or firm to install and remove. 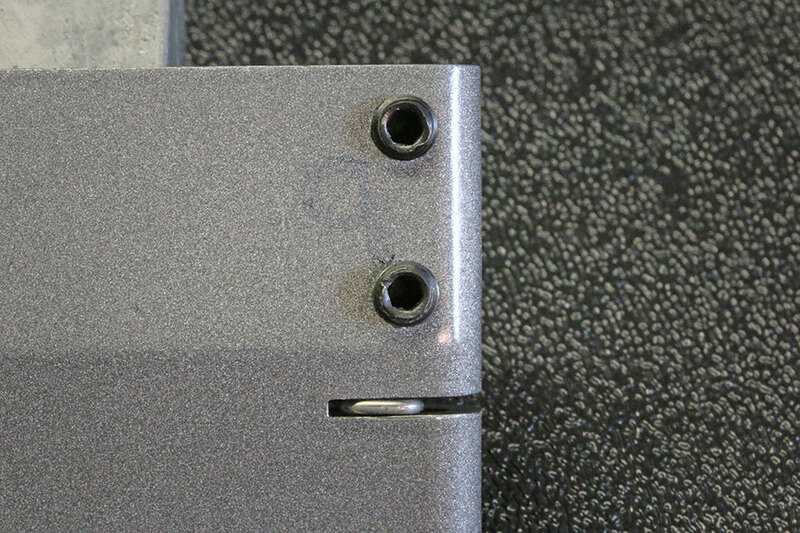 We have also seen where these bridge assemblies have had their tremolo arm retaining clips installed upside down which causes a tremolo arm to not engage the retaining clip at all. So be sure to review the photograph below showing the correct installation orientation of the tremolo arm retaining clip. To the best of our knowledge, Fender has never detailed what the two small sets screws found on the back side of the tremolo block are used for and a lot of people don't even know they exist. These two set screws are used to adjust the rotational friction of the tremolo arm. These set screws accept a 3/32" hex wrench and should only be adjusted with a tremolo arm installed so you can get a tactile feel to the adjustment changes. If your tremolo arm is loose or sloppy then this is the fix you've been looking for. To adjust these tremolo arm tension screws it is best to have the bridge out of the guitar with the tremolo arm installed and snapped in place, then as you rotate the tremolo arm you'll get a feel for its rotational resistance (friction) and then gently begin to tighten the upper-most set screw until you begin to notice the tremolo arm gradually begin to rotate firmer. Adjust the upper most set screw until you achieve a tremolo arm rotation feel that you are comfortable with. The lower-most set screw that is closest to the tremolo arm retaining clip will perform the same function and is really kind of a redundant adjustment and is really not needed to be adjusted additionally, but the lower screw can also change how your tremolo arm engages the tremolo arm retaining clip as well, so be mindful of any changes to the lower set screw in how firm or loose your tremolo arm pops into place. The upper set screw can be also adjusted when the bridge is installed in the guitar, simply install the tremolo arm until it pops into place and push down (dive bomb) on the tremolo arm to expose the set screw on the back side of the bridge under the top plate so you can insert the 3/32" hex wrench to make an adjustment. If you do decide to adjust it with the bridge installed be very careful when the hex wrench is inserted into the set screw that you DO NOT release the downward pressure on the tremolo arm until you make the adjustment and have REMOVED the hex wrench, otherwise what will happen is that with the hex wrench still inserted in the set screw and you release the downward pressure on the tremolo arm the wrench will come down and make contact with your bodies painted surface and surely damage the finish, so it is of the utmost importance to always make the adjustment to the upper set screw while holding down on the tremolo arm, remove the wrench and only then release the downward pressure of the tremolo arm. Always wear eye protective safety glasses when performing any of the steps below! Above: Depicting how to remove the tremolo arm retaining clip. Use a small slotted screwdriver or similar tool to gently tap out this clip at the angle shown above. Gently tap on the end of your tool with a lightweight hammer to slowly slide out the tremolo arm retaining clip toward the right as shown above. Above: American Professional Strat® tremolo block and the 0.050" thickness flat needle file. Inexpensive needle file sets can be acquired from such outlets as Harbor Freight Tools for around $3.00 a set and they are decent quality for the light work required of them. 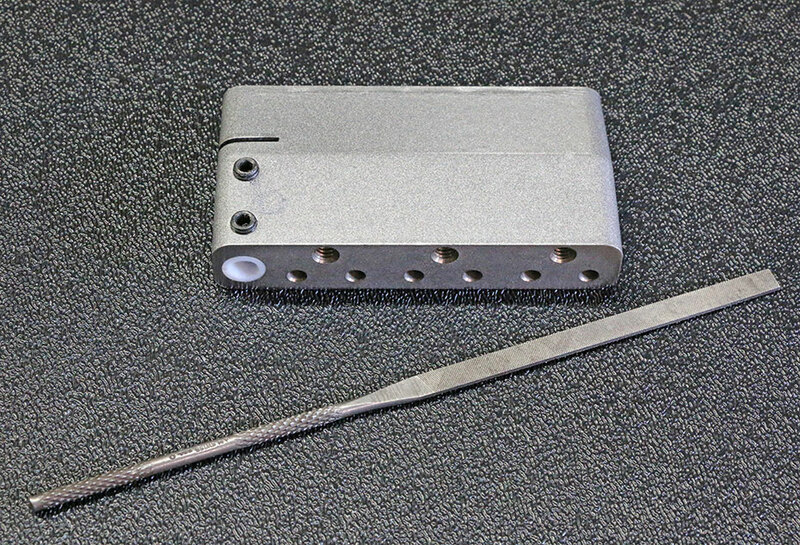 The above tremolo block as shown is setup for the American Professional Strat tremolo arm, notice that it has the white tremolo arm tensioning bushing. The only difference between the American Professional Strat and the American Deluxe Strat tremolo block assembly is the plastic tremolo arm tensioning bushing. The American Deluxe Strat's bushing has an inside diameter of approximately 0.218" where as the American Professional Strat's has an inside diameter of approximately 0.188", this difference is because each of these Strat's accept a different diameter tremolo arm, everything else about these tremolo blocks are the same for the American Deluxe and the American Professional Strat's. Typically the bushing for the American Deluxe is black and the American Professional is white, but Fender may change materials for these bushings at any time and colors may change. Above: The 0.050" thickness flat needle file inserted into the tremolo arm retaining clip slot ready for action. Simply apply pressure on the file flat sides on the upper and lower flat surfaces of the file to clean up this slot, then use pressurized air to remove any debris you may have removed. 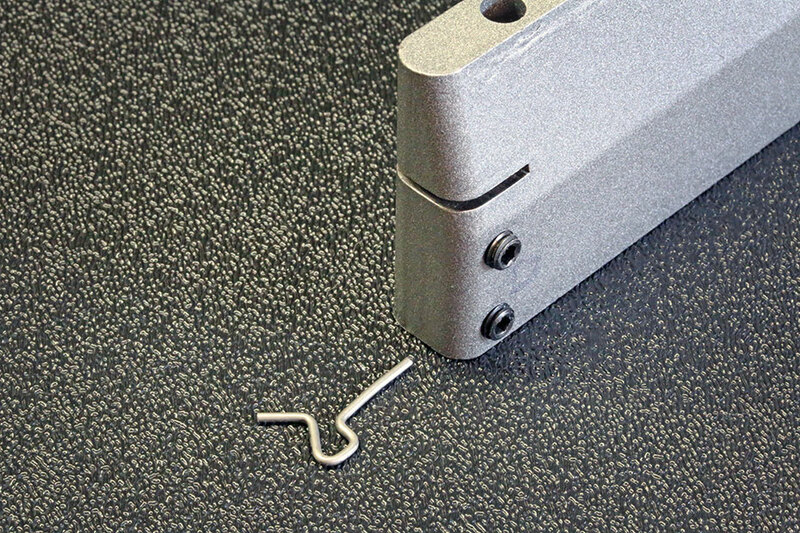 Above: Tremolo arm retaining clip shown in the correct orientation prior to installation in tremolo block. 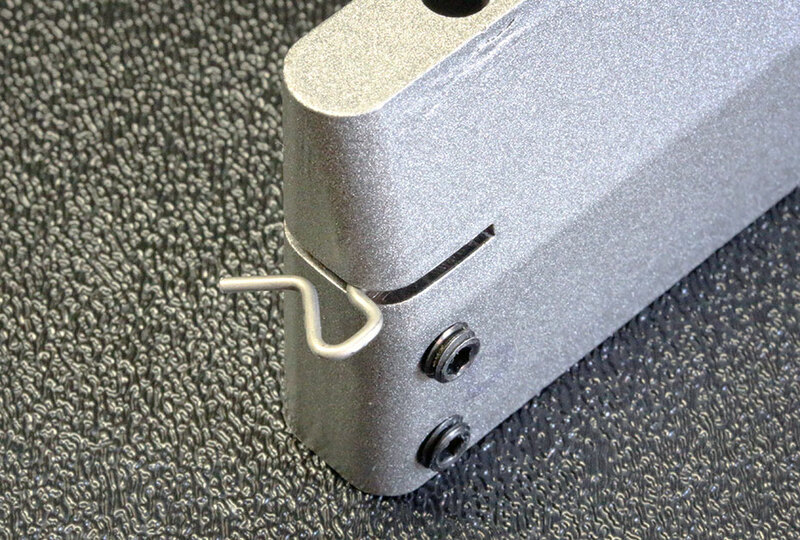 The longer portion of the tremolo arm retaining clip, the end pointing toward the tremolo block is supposed to have a very slight bend in it, this is what secures it in the small hole it gets pressed into by providing a bit of friction. Above: Tremolo arm retaining clip shown in the correct orientation as being installed in tremolo block. The above shows the clip just started in its installation, it still needs to be pressed in further as shown below. Installing this clip is not as easy as removal, so be careful when installing this clip so as not to bend or distort its shape. Above: Tremolo arm retaining clip shown installed all the way into the tremolo block. If your clip is not installed all the way as far as it can go to the left as in the above photo it will cause a difficult installation and removal of your tremolo arm.